About 6 months ago I bought a Drobo because I wanted to digitize all my media and I wanted something that would offer me the storage space I needed and was able to easily stream movies and audio to my AppleTV. 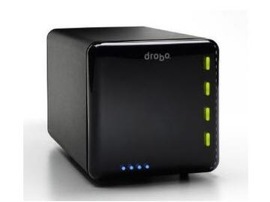 After alot of research on media solutions I choose the Drobo. The Drobo is a “storage robot” that allows me to slide in 3.5″ SATA hard drives and handles all the data back up redundancy efforts. It allows up to 4 hard drives to be in at once. I chose the Drobo for these 3 specific reasons. I didn’t have to buy all the drives at the same time. The niceness of the Drobo is that I can mix and match hard drive sizes. There is no need to have the same size hard drives. I originally bought the Drobo with 2 1TB Western Digital hard drives. This past weekend I bought a 1.5TB Wester Digital drive and added it to my Drobo. It was a simple operation, just sliding it in the bay. It supports up to 4TB hard drives. Yes that is right. It supports 4TB drives, which means my Drobo is expandable to 16TB. I know that 4TB drives are not generally available but this means that I am future protected. It is hot swappable. The drives can be hot swapped even while media is being streamed by it. So I can be streaming a movie from the Drobo to my AppleTV and take out one of the hard drives and the movie will not stop. It is a nice little feature. I am really happy with my Drobo. I think that it is a necessary component for any home media setup. It is the perfect network/USB/Firewire external hard drive. I have had no problems streaming content. Everything streams easily. It was definitely worth the money.